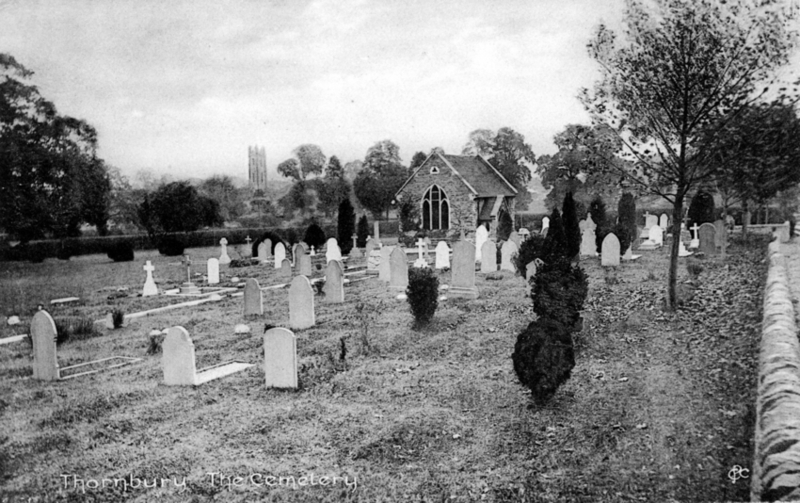 The Cemetery in Thornbury was opened in 1892. Previously all burials had taken place at St Mary’s Church, the Baptist Church, the Independent (or Congregational) Chapel or the Quaker burial ground at Lower Hazel. In the late 1800s there was concern that these grounds were getting full. In 1878 a Home Office Inspector of Burial Grounds examined the churchyard at St Mary’s Church and recommended that the churchyard be partially closed and that a cemetery be provided. A vestry meeting was held in the National School in August 1878 to consider the recommendation. Support was expressed by the Chairman of the meeting Rev. Thomas Waters who said that space for new burials was running short and it was better to have a gradual closure rather than an abrupt one. William Osborne Maclaine spoke against the practice of burying the dead just outside the church where people met for public worship, and where the fumes from the dead entered through the windows, contaminating the air and so injuring the health of worshippers, and causing them to die before their time’. Opposition for the idea came from Jesse Cossham who said he believed that there was plenty of space for burials in the churchyard. He proposed a motion that the ‘burying of the dead in the Thornbury parish churchyard be continued until it be found necessary, upon sanitary grounds or other reasonable causes, to close the said parish burying ground and provide a cemetery’. This motion was seconded by Henry Knapp. When this motion was put to the vote it was carried by 34 votes for and four against. The Gazette correspondent felt that there was concern that if there was a partial closure, then ‘it would be a rich man’s churchyard and a poor man’s cemetery’. Although the proposal for a new cemetery was not acted upon at this time, it seems that there was a restriction placed on any new walled or brick graves in the churchyard. In February 1891 an Inspector revisited the churchyard and determined that as it was nearly full it should be closed for all burials except in the case of widows, widowers and unmarried children of persons already buried. It was considered impractical to extend the existing area for burials at St Mary’s Church because Stafford Howard didn’t want his Castle garden to be used and there was concern about the nearness of dwellings to this location. He offered to give an acre of his other land for the creation of a new cemetery. His initial offer was a piece of land in the vicinity of the Castle, but it was pointed out that a similar plot of his land in ‘Front Church Lane’ (now Church Road) would have the advantage of being bounded by existing roads and would avoid placing the burial ground in ‘one of the most charming walks in the neighbourhood’. He agreed to offer this plot which was in the north west corner of the allotment field on the condition that it would be vested in the vicar and churchwardens but that it may also be used by Nonconformists. He reserved the right to select a space for himself and family and he determined that the burials of parishioners be free, but that there would be charge for non-parishioners. At a public meeting in April 1891 it was agreed that Mr Howard’s offer be accepted and the the public should raise funds to lay it out in proper order. It was estimated that the cost of building a wall around the site, erecting gates and providing paths and trees would cost between £250 and £300. A committee was appointed representing various religious denominations to raise subscriptions and lay out the ground. In July 1891 a meeting held at the British School resolved that the proposal did not meet the wants and wishes of a large number of inhabitants who held Nonconformist principles, even though they had been assured that the income from the burial ground would be used only for the maintenance of the burial ground and not go into Church funds. They thought it desirable that the burial ground be vested in trustees representing each religious denomination and not given to the vicar and churchwardens. This argument forced Stafford Howard to come out in support of a burial board which would create and manage a new cemetery for everyone in the district. A vestry meeting was held in September 1891 for the purpose of progressing the subject of a new burial ground and to appoint a burial board. A number of issues had arisen since the April meeting. Nonconformists wanted a burial board to manage the new ground with the expectation that Nonconformists would be represented, but there was a fear that the creation of such a board would be expensive. There was also some concern about the suitability of the proposed location in Church Road on account of the cost of digging graves in what was said to be ‘hard gravel’. H.P. Thurston suggested that the new burial ground should be split with a portion vested in the Church and a portion vested in trustees chosen from among Nonconformists. This proposal was accepted unanimously and a committee chosen to oversee the work and obtain the necessary funding. In November 1891 the Inspector of Burial Grounds checked out a new site in Kington Lane, after the two plots previously offered by Stafford Howard were rejected because they were found to be on rocky ground. An experimental grave was dug on the new site and the inspector expressed satisfaction with the ground and thought the natural drainage to be sufficient. He also said that the new site was ‘a pretty one’. On 29th June 1892, Stafford Howard gave some of his land in Kington Lane to enable the new burial ground to be created. Three separate transactions were made, one plot of two roods and 15 perches was given to the churchwardens of the Parish of Thornbury, the second plot of one rood and 36 perches to a group of trustees representing the Nonconformists of Thornbury and the third plot given to a group of trustees representing both the churchwardens and the Nonconformists. This third plot was intended for the purpose of erecting the mortuary chapel to be used by all denominations. We note that the plans for first plot included a section at the bottom of the cemetery earmarked for Stafford Howard and his family. As far as we know he never took up his option and this little section was later absorbed into the Church’s section. Based on an inscription still visible on his gravestone George Frederick Cribb was the first interment in the burial ground. He died on 3rd July 1892. This grave is situated behind the chapel on the west side – it is hidden under the evergreen tree which is fortunately protecting the stone from the weathering which has affected so many other stones nearby. Although the burials took place, the erection of the chapel was delayed through lack of funding. In December 1895 a special parish meeting was called to consider the situation. The burial ground was still in heavily debt (owing £21) and the income from burials was not covering the cost of maintaining the burial grounds in a proper state. The cost of erecting a chapel was estimated to be between £200 and £250. The decision to set up three separate sets of trustees to manage the burial ground was creating legal problems and making it impossible to gain the desired funding. It was decided that the only way forward was to transfer the responsibility for the cemetery to the Parish Council for for them to fund the cemetery by making a rate on the parish. On 31st December 1896 the three sections were taken over by the Parish Council who acted as the Burial Board. This would explain why the Cemetery’s burial registers start in 1897 as the earlier burials must have been recorded in the separate registers held by Churches. In April 1936 it was reported that a well was to be sunk and a pump provided at the Cemetery. The contract for the work was awarded to local firm W. W. Pitchers and Sons at a cost of £38 12s 6d. The work was to be completed by the end of April. According to a newspaper article published in July 1937 the job didn’t quite turn out as planned. At a meeting of the Parish Council it was claimed that they had tested the system thoroughly before the work had begun and found it satisfactory. However when the well was dug they found that they needed to go down thirty five feet, ten feet deeper than anticipated. As a result, the rotary pump they had purchased would not work. They had to build a platform in the well which eighteen feet below the ground level. A ladder was put into the well to allow a man to climb down to the platform. This was claimed to be an acrobatic and dangerous feat. If the ladder was placed against the wall, the top slid from side to side as the man descended. If the ladder was placed sloping against the opposite wall it was difficult for the man to descend the last few feet to the platform because his body was pressed against the wall. It was recognised that if an accident happened when the man was down the ladder it would be difficult to provide him with assistance. It was noted that the Council had ruled that another man had to be attendance when someone entered the well, but that in practice the man went down unattended. It was also noted that the Council had decided previously to buy a suitable ladder for the purpose but it had not been bought because it had been considered unnecessary. It is worth noting that not all the Councillors agreed that the situation was unacceptable. It was proposed that they should investigate the cost of a suitable pump, and the only person to vote against this proposal was the Chairman of the Council, Arthur Charles Pitcher, who happened to be related to the contractors who had done the work! As the Cemetery filled up, more land was required. On 13th November 1930 the Parish Council acquired a further one acre of ground from John Taylor, retired butcher. They paid £150 for the land. This enabled the cemetery to be extended in an easterly direction towards the Town. 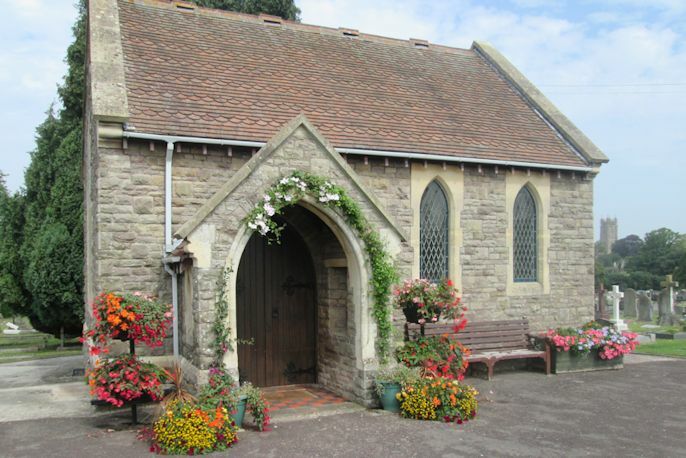 On 7th March 1975 the Thornbury Town Council acquired two further plots of land. These were fields numbered 2828 and 1729 on the OS map and comprised 4.43 acres. They were bought from Phyllis Doreen Clutterbuck of Cannon House, Crossways and others for £8250. Of these fields, the first has been used to provide an access road and car park and is still being used for burials. The second field is currently a wild flower meadow until extra space is needed for burials. In May 1950 the Parish Council sitting as the Burial Board considered an offer from a former townsman now living in New York. Ernest H. Vizard of North Salem, New York had read an article in the Thornbury Gazette saying that the Cemetery gates were in need of repair. He asked that the Council send him an estimate of the cost of replacing the gates because he had two relatives buried there. It was noted that Mr Vizard was formerly with the late Major Mundy for some time and then went to the USA in 1915 where he had ‘prospered very much’. The Council were happy to accept the offer and Messrs W. W. Pitcher made the lowest tender for the work of £35. This was sent to Mr Vizard, but we don’t know what happened.